Since then, we started and completed Season One of the Duke City Pinball League and are currently in the middle of Season Two. My wife and I now have one-year-old twins and very little time for pinball (thank goodness for League nights!) A very popular pinball mod business has sprung up in the area (Mezelmods.com, go check them out). EM Pinball ABQ has grown and has a shop packed full of pinball machines right near the heart of the city. PinballMap.com has it's own Albuquerque section now. The Facebook group has grown to over 100 members, many of which have fantastic collections right here in the Albuquerque Area. You can always email me at dukecitypinball@gmail.com, but the Facebook group is definitely the best way to stay alert to new pins, new sales, league information, tournament information and more. Keep in touch and thanks for checking out, DukeCityPinball.com! 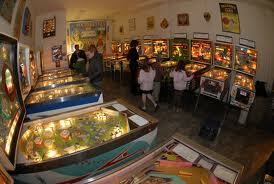 Albuquerque area pinballers... I'd like to invite you all to the first Duke City Pinball open house of 2012. It's been far too long since we've had a get-together, but we will be hosting a pinball open house at our home on Saturday, June 30th at 4pm. Come play pinball and hang out with other pinheads, enter a tournament or two for fun and prizes, it'll be potluck-style, so bring some food to share and be ready to enjoy lots of different items from our talented members! Admission is free, but tournaments will likely have a buy-in. RSVP for directions. Family and guests are welcome. Children must be attended, please. Tournament games and rules will be announced soon, to allow time for everyone to bone up on the games involved. Titles available for play include: Twilight Zone, Road Show, Judge Dredd, Congo, The Simpsons Pinball Party, 1963 Beat the Clock, Pin*Bot, Tales of the Arabian Nights, World Cup Soccer 94 and an unannounced Stern game I guarantee you haven't played before (assuming it arrives in time)! Albuquerque has been added to PinballMap.com! PinballMap.com is the biggest/best pinball map on the web, and now you can browse machines and locations right here in the Duke City. At this time, 23 locations with nearly 40 machines have been listed. In addition to the online element, The Pinball Map is available on iTunes and the Android Marketplace! FOR FREE! Download it now and take the map with you as you travel. So, you've got 'real life' pinball players and you've got video gamers. There are some of us that are familiar with both worlds, but it seems as those many pinball players don't know where to start with current generation video gaming, and many video gamers think pinball died years ago. Despite this, Pinball FX2 was the highest selling XBox Live game of 2011. That means that there are lots of video gamers who are interested in playing the silverball, and probably quite a few pinheads who have stepped into the realm of virtual pinball. Pinball FX2 is currently the premier place to go for pinball on a console. The team at Zen Pinball (developers of PBFX2) have been regularly adding new tables and content to the game since it's launch in October of 2010. Also, many of these tables have been ported over to 'Zen Pinball' on the PS3 and in its mobile phone version. The tables are sold piecemeal for the most part, meaning that you can buy the tables you are interested in, without buying tables you may not like. I recently noticed that people just don't know where to start, which tables are worth buying, and which ones they should pass on. As a pinball enthusiast, I find myself supporting the hobby and have purchased all of the tables available currently. As such, I aim to write this guide to the tables, from the perspective of someone who is familiar with 'real' pinball machines, as well as their virtual counterparts. It should also be noted, that on many platforms, the tables may be played once as a 'demo' before purchasing the table. - The ball moves very quickly through the inlanes, may be difficult for new players. - Compared to the other tables in the 'Core Pack', there is not as much going on with this one. Consists of four tables: Speed Machine, Xtreme, Agents and Buccaneer. - Hit the upper loop and whirlpool shots during multiball to occupy a ball while you focus your shots with the others. - The slingshot plastics are boring. - Play one of the many other available tables. - The outlanes are much easier to manage than in STTNG! - Controller vibration increases as timed modes count down. - 'Picard maneuver' is disabled! That's THE shot on STTNG. This time the shot is interrupted by the jet bumpers. - Many shots lead to 'saucers' that interrupt the flow of the game. - The slingshot hand 'cannons' are for show only... They do not function in the game. - Great art design. Classic style that is as much fun to look at as it is to play. - Is that Danny Trejo? - Bomb Bumpers. FIVE jet bumpers are a lot of fun. - Based on the best selling flipper pin of all time, The Addams Family. - The upper flippers are difficult to see in most views. - The generic soundtrack becomes grating. My gamertag is CallMeSteam if you'd like to compare scores or bump up your wizard score. Comments, suggestions and corrections are welcomed. So, I was playing a friends 'Star Trek: The Next Generation' game the other day, and noticed how easy the 'Picard' shot was. It got me looking at mine, and I thought my upper flipper might need a little adjustment. I dug in, did my adjusting and then noticed that my lower right flipper might need a little tweak as well. I adjusted it, but thought... ah... that flipper is a little discolored, I might as well see if I have a spare new flipper on hand. Sure enough, swapped it out, and saw the real different between a nice, fresh new flipper, and a 20 year old, beat to heck flipper... You can see the difference as well in the above photo. What's going on in your pinworld right now? So, with a stack of instructions in hand, I set out to swap the gate assemblies. Besides shopping an entire game, this is one of the largets projects I've worked on. I figured it would take about 5 hours, and I was right on. That included time to install Cliffy protectors and plastic protectors, and clean anything I came across. Besides stalling out while testing the gate. It did take about 4.5 hours. Unlike the instructions, I opted to unsolder the optos, and that only took a moment. I assume its much faster to unsolder and resolder the optos, than to pull all the wires out, one by one, but both methods work. Here's a shot underneath the game, with the mech and moat removed. It's a pretty large hole.